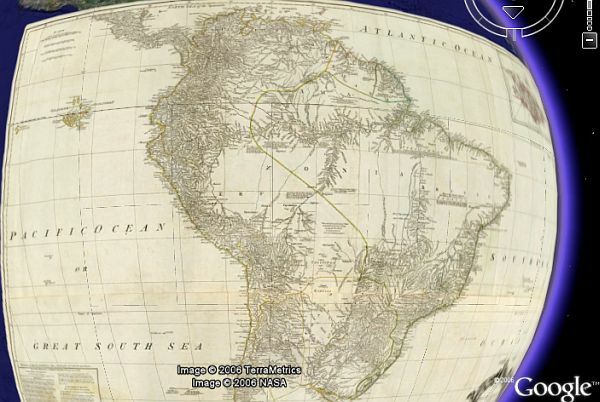 The popular Rumsey historical maps, which were released in early November, are now available in the other localized versions of Google Earth for French, Italian, German, Spanish, and Japanese. Initially, these maps were only available in the English versions of GE. The Rumsey historical maps, when turned on, overlay their approximate location on Earth. You must be using Google Earth 4 (download here) or you will not see this layer. Go to the "Featured Content Layer" and open the folder. Look for the "Rumsey Historical Maps" and open that folder as well. Turn on the map that interests you. The "Map Finder" option shows the locations of the different maps. You can then turn on each map and they will be overlayed in GE. The maps are "regionated", which means they will load more detail as you get closer (the map images were scanned at a very high resolution). See Rumsey's Google blog entry about the maps. sorry but I can�t find an "featured content layer". Where is it? In the menu I only can add Image-overlay. I�ve got the german version, so it maybe a translation problem, but if you describe me how to find it I�ll be happy. In the German Version you can find the historical Maps under "Alle Ebenen", "Empfehlungen", "David Rumsey."